Getting to Maastricht Airport (MST) in The Netherlands is easy by car or bus and train combinations from Germany and Belgium. Maastricht Aachen Airport (MST) is in the region Beek near Maastricht in the Dutch province Limburg. It is also close to the German town Aachen as well as Belgian cities such as Liege and Genk. The vliegveld is very important for cargo flights but also sees an increasing number of low-cost airlines including Ryanair, Wizz, Corendon and Germania. Getting to Maastricht Aachen Airport (MST, sometimes wrongly abbreviated to MAA) is easiest by car. The airport is adjacent to the highway A2 just 8 km northeast of Maastricht. Fast roads can get travelers into other Dutch cities as well as many communities in Germany and Belgium. From the highway A2 / E25 use exit 50 for Maastricht Airport. For short-term parking, the more convenient Parking P1 is only marginally more expensive than P2. Both are within walking distance of the airport terminal buildings. Car hire firms with rental desks at Maastricht Aachen Airport include Hertz, Sixt, and Europcar. Advance reservations are highly advisable. Getting to Maastricht Aachen Airport MST by public transportation always ends with a bus ride, as no trains stop at the airport itself. A public bus service is available from the airport to Maastricht and other Dutch train stations. The Gilbacher AirportXpress to Aachen is no longer in operation. Taxis or airport shuttle vans may be worth considering for small groups or travel at odd hours. My Driver gives online quotations for private airport transfers without first requiring personal details or flight numbers. For travelers heading to other destinations than Aachen, the Arriva Bus 30 (previously Veolia public bus nr 59) is usually the best public transportation option. Bus 30 connects Maastricht via Maastricht Aachen Airport with Sittard. En route, the bus also stops at Meerssen train station. Bus 30 generally runs twice per hour taking around 30 minutes from Maastricht to the airport. From the airport to Sittard takes around 40 minutes – it is sometimes faster to take the train from Sittard to other towns in The Netherlands than traveling via Maastricht. The timetable can be checked at 9292. The site is available in English but has a few absurdities. The bus stop at the airport is called “Maastricht-Aachen Airport, Moorveld” while some sites use “Beek, Maastricht-Aachen Airport” (just Maastricht Airport may direct travelers to MAA Leeuwenborgh at the “wrong” side of the airport for air passengers). For travel to Maastricht, 9292 usually gives two options: the simplest is the direct bus 30 from the airport to Maastricht. The second option is to take bus 30 in the direction of Sittart and then change to a train heading for Maastricht at Beek-Elsloo. On the whole, waiting for the direct bus is less hassle. 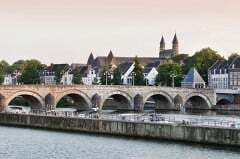 If using the direct bus from Maastricht Aachen Airport to Maastricht, the one-way fare is currently €3.17 when using an OV-chipkaart travel card, or €4.80 if the ticket is bought from the driver. Day-tickets are a very good deal if planning more journeys on the day. Travel from Maastricht to Aachen is fastest by bus 50 – railway travel will require a train change in Heerlen. The fare from Maastricht Airport to Aachen on bus 30 and bus 350 is currently €8.68 on the chip card (a bit more for cash). Traveling time is around an hour and a half. Onward transportation is available from Maastricht to cities in Belgium and Germany. Train rides to Germany usually require a change in Heerlen. Traveling time to Liege in Belgium is 1h20 by bus 30 and then train from Maastricht. Flixbus also has an increasing number of destinations from Maastricht with very cheap tickets available to amongst others Brussels and Paris. Aachen has a popular Christmas market but the town is worth visiting year round to the see the Imperial Cathedral with its links to Charlemagne and to visit the relaxing Carolus Therme day spa.